There is an idea abroad that capitalism is a system of greed and exploitation. It is a system where rich land or resource owners employ poor and needy individuals, set them to work tirelessly like slaves for hours on end, and pay them peanuts for their efforts. ‘Down with such a system’, is the cry. And indeed, no Christian can support a system that derives its spirit from greed and oppression. But is this the case with Capitalism? This popular misunderstanding of capitalism has been around for so long (you even find it in Economics departments!). So it is always a relief to find a book (and there are so many) that attempts to correct it. And I think Money, Greed and God does a fine job. 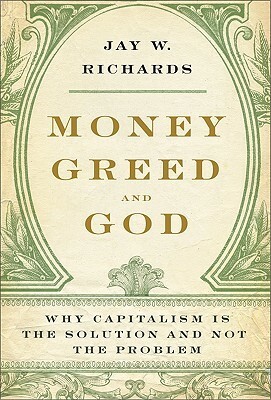 It is authored by Jay W. Richards, a visiting fellow (as at publication) at the Heritage Foundation. He notes on page 5 that the first step is to understand clearly that economics is not an esoteric science. It is about us. Doesn’t capitalism foster unfair competition? Isn’t capitalism based on greed? Doesn’t capitalism lead to an ugly consumerist culture? First he tackles the Nirvana Myth, which contrasts capitalism with a morally perfect society, and on the basis of this contrast rejects capitalism as deficient. No society is perfect. However, of all socio-economic systems, capitalism is the most compatible with the truth about man. Communism, as the history shows, does not come close to making human beings happier. Capitalism still holds out greater hope for the world than any system of complete state control. The Piety Myth is the focus on our good intentions rather than the unintended consequences of our actions. A lot of modern ‘compassion’ (welfare, foreign aid, fair trade) are actually counterproductive. They cause more harm than good. How? They make people more dependent on the government and stifle individual initiative and creativity which are essential to economic growth. The third myth is the idea that there is always a loser in trade. Actually, trade only occurs because each party derives some benefit from the transaction. And in the end they are both better off. Provided it is not forced or coerced and there is no deception involved, trade will always result in a win-win situation. Capitalism allows individuals to create wealth and not merely distribute it. The wealth of nations isn’t static as the Materialist Myth assumes. It grows. A free market built on a reliable moral and legal system encourages individuals to create wealth thereby helping to alleviate the problem of poverty. Contrary to the Greed Myth, the essence of capitalism is not greed. And contrary to some supporters of capitalism, greed is not a virtue. It destroys individuals and destabilizes society. This is a much-needed book, and I thank God he has made it available! Nice post. I’m going to have to check this book out.